Firefox add-ons are a great way to add features and improve security in Mozilla's browser, but they can seriously slow performance too. Now Mozilla is taking action against those speed-killing extensions. In an April 1 blog post, Mozilla product manager Justin Scott outlines a series of initiatives designed to minimize delays caused by add-ons. "Firefox performance is extremely important to our users, especially how quickly it starts up and loads websites. Customization is also extremely important, and while most add-ons cause only a tiny performance impact, others can significantly slow down Firefox," Scott writes. The slowdown can be significant, particularly if you're running several add-ons at a time. 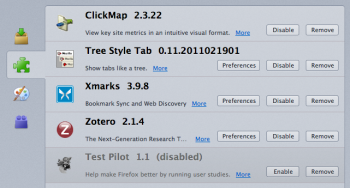 According to Mozilla, each add-on adds about 10 percent to Firefox's startup time. The company's performance data shows that installing 10 add-ons will double the amount of time it takes the browser to launch. In an era where speed is king--performance is the most appealing attribute of the latest versions of Google Chrome and Microsoft Internet Explorer -- the move to address speed-killing add-ons is critical. Mozilla's new Firefox 4 browser promises faster graphics rendering, page loads, and startup times. Faster add-ons will help the new version succeed, too. So what's Mozilla doing about slow extensions? First, it's running automated performance tests on the top 100 add-ons and posting the results. The worst offenders, which currently include the FoxLingo Translator/Dictionary and Firebug, a developer's tool, will be publicly shamed. Users will know which add-ons to avoid. Mozilla is asking developers of slow add-ons to improve the speed of their software. In addition, its add-on gallery will show warnings of programs that slow Firefox's startup time by 25 percent or more. A future version of Firefox will display these warnings in the browser's Add-Ons Manager too. Third-party software is notorious for installing performance-killing browser toolbars and other add-ons without your permission. To prevent that, an upcoming version of Firefox will not allow the installation of third-party add-ons in the browser without your consent. "We expect this to have a huge impact on Firefox performance, as well as giving users back the control they should have over their add-ons," Scott writes. If your version of Firefox is running slowly, the best way to speed it up is to disable add-ons you aren't using. These instructions from Mozilla tell you how to disable or uninstall add-ons. By turning off an add-on, you're preventing it from loading (and slowing) the browser. Since you haven't uninstalled it, however, you can always reactivate the add-on later, if you need it.